Soon after the end of the great rebellion of 1857 by the frustrated Indian soldiers, rulers and others against the English company's misrule, the administration of the Indian subcontinent came under the direct control of the British Crown. The British India government was advised to start many educational institutions to train Indians for teaching, administrative work, etc. After 1860s many educational institutions came up and many of them run by the Christian missionaries. Boy's school in Allahabad was one among them. The school had a very humble beginning - classes were held in a building with a thatched roof and since that time, the school had undergone several changes in terms of building and curriculum. . Since 1940 it has been managed by the Allahabad High School Society. It is currently affiliated to the Council for the Indian School Certificate Examinations. In the beginning, languages such as Latin, French and Greece were taught, in addition to maths, English grammar, etc. In the present set-up, the school also gives serious attention to extracurricular activities for students. The school conducts courses classes in swimming, gymnastics, etc on par with national and international level. The unique aspect of this school still maintains the old tradition of giving training as preparation for armed forces The school has also sent a number of boys to the National Defence Academy, a prestigious military training institution under the Central government. Many of the alumni of his historical school have made a mark in various important fields, executive, judicial and political fields. On 5 November 2013, UP Governor B.L. 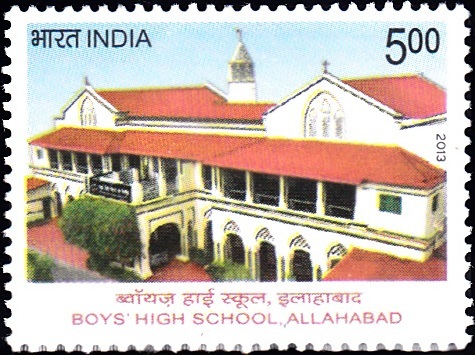 Joshi released a commemorative postage stamp to mark 150th anniversary of Boys' High School. Mr. Amitabh Bachchan, now a popular Bollywood actor studied in BHS from Class 1 to 7.